There is a love and hate story with this bread. And maybe this is what makes it exceptional. 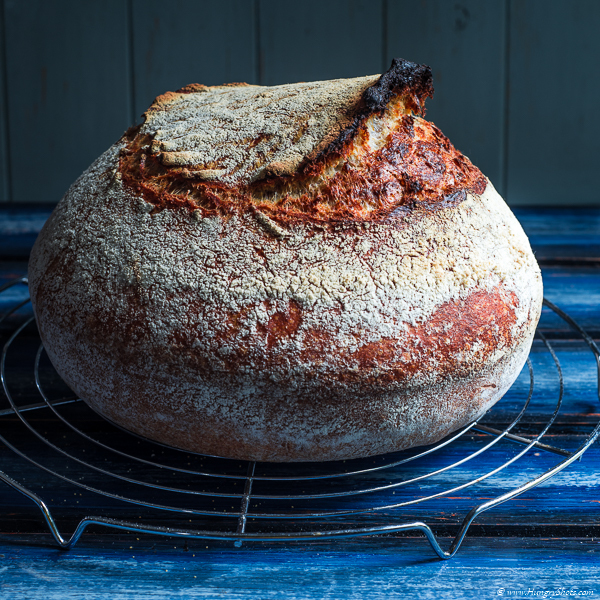 I love the taste, I love how it grows, I love its texture, I love how it sings, I love how it opens its ears, I love its colour, I love everything about this bread except what I hate for it... and that is working with its dough. It is so so difficult to preshape and shape such a wet dough. It is more like a running dough that sticks to everything: the board, the cutter, the hands. When you face this, the only way is to add more flour at the preshape phase in order to get rid of the whole mess. Remembering the experiences, I have added 50g of flour more straight from the start. This made wonders later in the preshaping phase. Other changes I made for this version were totally unintentional. The schedule was a complete challenge to fit in the program of the baking day, so I handled the bread phases only between other things. The unexpected impressive result made me wonder what have I changed so much to make it so better. Day 2, 9:35AM, in the mixer's bowl add 700ml water and the 2 types of flour. Start the mixer for 3 minutes just to insure that all ingredients are well mixed. Day 2, 10:25 AM, add the preferment, salt and the remaining 50g water and mix well for 10 minutes. Day 2, 10:45 AM, cover the bowl with a lid and do the bulk fermentation for the next 3-4 hours. During this time do 3 stretch and folds (at 11:15; 12:00; 12:45). Day 2, 15:40, remove the dough from the bowl and put in on a board. Preshape as a boule. Let the dough rest for 30". Day 2, 16:10, shape the big bread and place it in a floured banneton. Do the final fermentation until 18:40. Day 2, 18:20, 20" before the bake, preheat the oven and the dutch oven with its lid at 275ºC. Day 2, 18:40, put the loaf in the hot cast iron pot. Dust the bottom of the dutch oven with semolina to avoid sticking. Bake for 20 minutes with the lid on, keeping the same temperature and then remove the lid and continue to bake for another 35".